We are really enjoying our exploration of Playa del Carmen. I can see why people like this town. There’s a great street filled with shops and restaurants that is just for pedestrians. Yesterday we spent the day exploring this street, we checked out the beach (water is cold compared to Panama!) and we even managed to get some groceries and a few beauty treatments. A new country calls for a new color of toes. And the weather? Lovely. It’s still a bit humid but not as hot as Panama. We spent most of the day outside yesterday. The evenings are particularly wonderful. But here’s one thing that’s driving us all a little bit crazy…. PESOS. What are they and why are there so many of them??? Honestly! I know it’s just a math problem and all you have to do is a few calculations in your head but it’s not that easy! For one, the calculations from pesos to dollars is one formula but back the other direction is another. And who remembers their division facts by 16? Not I. And multiplication by 6 isn’t that much easier. And as I write this I’m not even sure if that’s how you figure out the conversion. Honestly the whole thing confuses me unless I really concentrate on it. I have a currency calculator on my phone. First it was tucked away in a little folder with my Spanish dictionaries and verb conjugators but by noon yesterday I had moved it out of the folder and into my home screen. I think I even bumped the Facebook icon off, it’s that important. But the calculator doesn’t help on the fly. It goes like this: you are getting groceries and are told it’s 562 pesos. First you have to translate the words (“Did he say 5 thousand or 5 hundred? How much was that bacon?? ?”) and then you realize it’s mas o menos $30. I round to the nearest 10 generally. Anyway, then you hunt through all your unfamiliar coins and bills and you pay the guy and you start to walk away but then the guy who nicely loaded all your groceries in a box looks and you and expects a tip. OK, I’m totally fine with tipping. He did a nice job. But at this moment I have to figure out how much is about 50 cents in pesos. It’s neither the time nor the place to pull out the handy dandy currency calculator. So I panicked and I pulled out what looked like a small amount of pesos and handed it over. On my way out of the store the calculations in my head finally finished processing and I realized I had given him $6. Probably made his day. Probably wasn’t the first time either. The other thing that can get hard is when Zoe wants to buy stuff. She has an allowance that I keep track of but it’s in dollars. 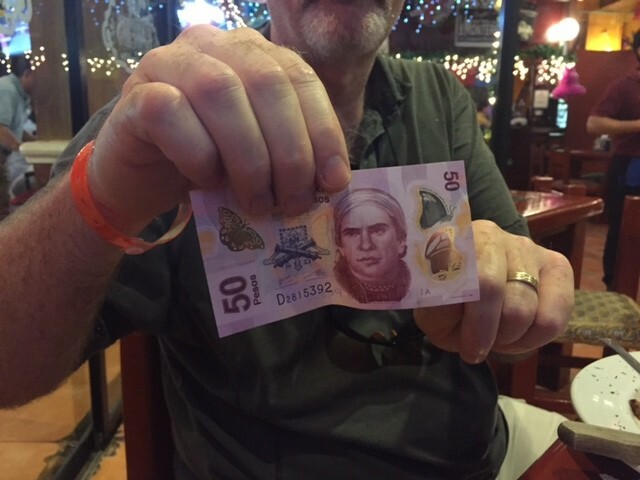 So when she buys stuff in pesos I have to convert it to dollars, take it out of her allowance, then calculate how much money she has left and tell her what she can spend in pesos. I’m going to make her track this all for herself pretty soon. I’ll tell her it’s part of homeschool but it’s really because it’s way too confusing for the teacher. Pesos have this nifty see-through window. Lots of countries have that see-through window on their bills. Canada, Mexico, Australia, Nicaragua, and many more. Tougher to counterfeit, allegedly.